The following are actual, direct quotes from the people in the millennial generation, and those who mentor them. I gathered these quotes because I notice how often the millennials and those who mentor them, speak of "this generation." "We’re just bringing this single message: that God is offering a reset to this generation," Nick Hall & Reset Movement. "Abolish injustice in 21st century". Christine Caine, A21 campaign’s goal. "This generation is a generation of risk takers." Bill Johnson, Charismatic Christian revivalist, itinerant speaker, author, and a Senior Pastor of Bethel Church in Redding, California. "There’s a whole Esther Generation rising right here and now and it is us!" Ann Voskamp & Amena Brown Owen. "The Lord is bringing forth His rising remnant as the Joshua Generation," Rob Winters, co-founder of an itinerant prophetic ministry based in Phoenix. 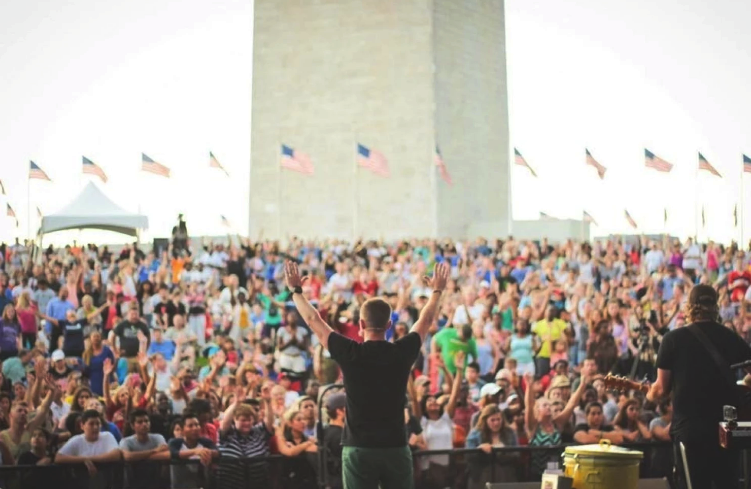 "Our Mandate- Mobilizing a generation of revivalists who shape culture and transform nations." Kim Walker-Smith, Jesus Culture. 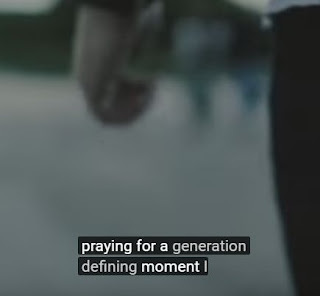 Wait...Joshua generation? I thought it was the Esther Generation. Maybe it's the Esther generation for girls and the Joshua generation for boys. I'm anxious to see when they will call themselves the Eve generation or the Adam generation. We do know there is a Jezebel generation. Jesus said so in Revelation 2:20-23. The boundless confidence these people have to self-identify an entire generation with Biblical heroes and heroines and their conceited call to grandiose action is hubris beyond compare. Look at one example: Christine Caine's A21 goal, to "Abolish injustice in 21st century". Isn't that what Jesus promised to do when He returns? (Isaiah 9:7, Ecclesiastes 3:17, 2 Thessalonians 1:6). Statements like those are why I say these millennials and mentors of millennials believe they are puffed-up saviors and not humble disciples. The millennial generation speaking these things and following its leaders, don't know anything. They not only don't know biblical truth, they don't want to know. There was a song 50 years ago by The Rascals called "How Can I Be Sure" which sang the refrain "I really, really, really want to know." Phil Johnson opened his sermon titled "A Certain Uncertainty" by referring to that song and comparing that generation to today's. One of the major differences between now and then is that the Millennial Generation doesn't really, really want to know...anything. The majority of people today like to react to things with great passion. They love slogans and hashtags, and all the symbols of deep conviction, but they really don't believe anything in the classic sense of belief. You know, with firm conviction and bold confidence. They don't know and they don't believe it's possible to know absolute truth with any kind of settled certainty. Rejecting and thus lacking the all-important bedrock belief in the doctrines that form our faith, the millennial generation clings instead to an amorphous notion of a wimpy Jesus who provides "a better life". Of course, anyone who dares to define exactly what that ''better life" consists of is deemed as hopelessly arrogant as the ones who declare biblical truth with certainty. But this kind of Jesus they have created is comfortable because now they can now run off in all directions as duly commissioned disciples "helping" Jesus bring that better life to the masses. We're shaping nations! We're changing cultures! We're abolishing injustice! Having lost the Gospel focus, and because a vacuum must be filled, it's now the activity in solving social ills that becomes the absolute certainty, not the Gospel. They're also absolutely certain that they are the one and only generation to do it. Though they eschew biblical certainty, it's certainty that drives them. They promote the positive and certain notion that they are the generation that will sweep in and solve everything, by resolving age-old social ills. They claim they are the ones slated to be the generation that shapes cultures, accelerates revival, and transforms cultures. Not to mention resolving injustice along the way. They promise that God has big plans for them. They promise revival and peace. Big plans, revival, and justice is not what Jesus promised, to 'this generation' or any other. For those who truly seek Him, they are called to self-deny, slay sin, persevere in faith. This generation, and every generation, is promised not revival, but apostasy, persecution, and trouble. Far from the lofty promises of the Millennials like Nick Hall, this generation and every generation is called to slog through every day life pursuing holiness and witnessing of Jesus. It's nice that people like Christine Caine and Nick Hall and Jennie Allen feel they are a cut above with their sweeping call from a christ (not THE Christ). I, however, feel lucky to make it through each day simply not tarnishing my witness, dishonoring my elders, or disobeying my leaders. One thing that reading old missionary stories reveals is just how much of an eternal perspective they had. You see this originally among the Bible's apostles and pastors. Their work was for disciples of ALL generations, just look at the mandates for all ages in congregations in the New Testament that cross generational lines. 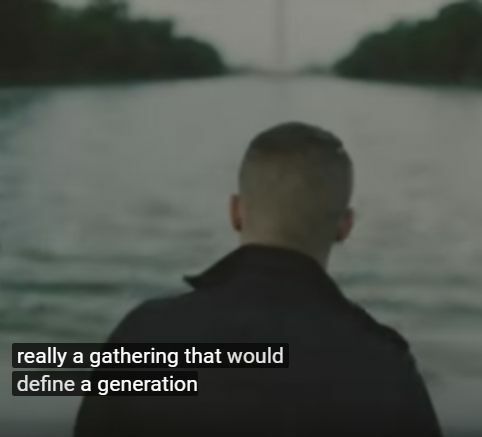 But if you listen to these Millennials and those who mentor them, one would think the entirety of Christendom is filled solely with hip young people and no one else. 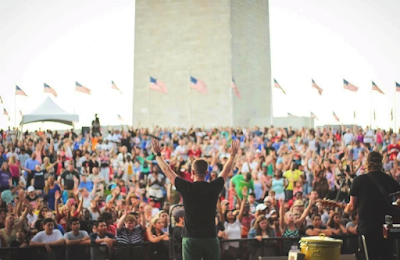 In this 5-minute Youtube video you see Nick Hall explaining his reason for founding the Together 2016 event held this past weekend at the National Mall in Washington DC. He also founded the "Reset" movement. It was a religious event (not a Christian event) that promoted unity among "this generation", a coalescing of denominations (which include Roman Catholics), and the certainty that God was going to make a big move at the event. Hall speaks of "this generation" three times in 15 seconds at the beginning of his speech. He says he wanted a generation-defining moment. He wanted to organize an event that would define a generation. A monumental effort to which all the nations would look. To really understand the grossness and puffed up ignorance of people like this and movements like this, compare what they say their goals are to Jesus and the apostles. Try to picture one of them saying what people like Hall say. Did Paul ever tell young Timothy he was called out to define a generation? Did Peter ever tell young Mark to disciple a generation? Did John ever tell any of his disciples that they were going to change the culture? If the incarnated Jesus didn't transform the culture while He was at His zenith of popularity, what makes people like Nick Hall, Ann Voskamp, Christine Caine, Jennie Allen and the rest think they will do it? The problem comes from their lack of settled conviction. More to the point, they don't know the Bible and they don't want to know it. This means they don't want to know Jesus. They reject Him outright. Really, you say? Really. They really, really don't want to know. 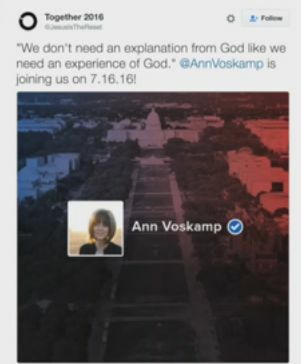 Here's a recent statement from Ann Voskamp that the Together2016 campaign tweeted out after they'd received her commitment to attend the event. Saying she doesn't need an explanation from God is saying we don't need the Bible. The Bible IS the explanation from God of who He is and Why He sent His Son. (2 Timothy 3:16-17). The explanation of God is His Son, His inspired Word. Well, this past weekend at Together 2016 Voskamp and the others received their "experience". They experienced heat, apostasy, mutual ignorance. They experienced a hardening of their reprobate minds into worshiping the creature rather than the Creator. They experienced mutual admiration and temporal promises. They experienced a false unity and a damning conviction. You're welcome Sue. Thank you for reading and commenting. Don't let Francis Chan off the hook for participating in this event either. He is a wolf but he is idolized by most church goers I know. I agree. This makes me sad, and concerned for my younger children. A well written article. From my own experience, seeking God happens when on your knees in great distress, when you know how pathetic you are and how completely incapable of doing anything worthwhile. And yes, I have suffered persecution on many many occasions for my belief in God and Jesus. But you know what? It's been worth it, I wouldn't change it for the world. Blessings my friend and don't worry about the "Millennials", God knows what he's doing and who will eventually come to him. Please be in prayer for those of us who are Millennials and believers and who hate false teachings and ministers pandering to us. It is very lonely, and we experience hate, persecution, and being termed "Pharisees" because we love sound doctrine. We will not rationalize sin and things are difficult for us because so few in our generation are willing to contend for the Lord Jesus.